Ahoi Ashtami vrat and puja is dedicated to Ahoi Mata or Goddess Hoi and is observed by mothers for the welfare of their children. Ahoi Ashtami 2019 date is October 21 in most regions in North India. Chandrodaya or moonrise time is at 11:29 PM. Hoi mata vrat is more popular in North India especially in Uttar Pradesh and Bihar. When is Ahoi Ashtami vrat Observed? It is observed on the eighth day during the waning phase of moon or the Krishna Paksha Ashtami in Kartik month as per traditional Hindu calendar followed in North India. Ahoi or Hoi Mata is a manifestation of Mother Goddess Shakti and is worshipped mainly by the female members of the family. She is worshipped on the walls of rural homes. Her image is painted on the walls during Ahoi Ashtami and other festivals. She is worshipped for healthy and long life of children. Rural legends suggest that she protects offspring of all living beings. A popular story associated with Ahoi Mata states that a mother had lost seven sons. She was able to get back all her sons safely after observing Ahoi Ashtami Vrat. A woman had seven children. Once she went to the forest to get soil for the renovation of her home. While collecting the soil, she accidentally kills a lion cub. She was saddened by the incident. Over the next year, her seven sons died, and she was convinced that the children died because she killed the lion cub. She told about her dilemma to a neighbor. The neighbor asked the mother to pray to Goddess Ahoi Mata. She fasted on the Kartik Ashtami day and did all the rituals. Soon a miracle happened and all her seven sons returned back. Ahoi Ashtami fasting is from morning to sighting of the moon. Some people end the fast when the first star is sighted. Women observing the vrat rise before sunrise, clean the house, take bath and then visit a temple. She then observes a fast from sunrise to till the sighting of moon or the first star. During the course of the day, she places a bowl of water before the drawing or picture of Ahoi mata. 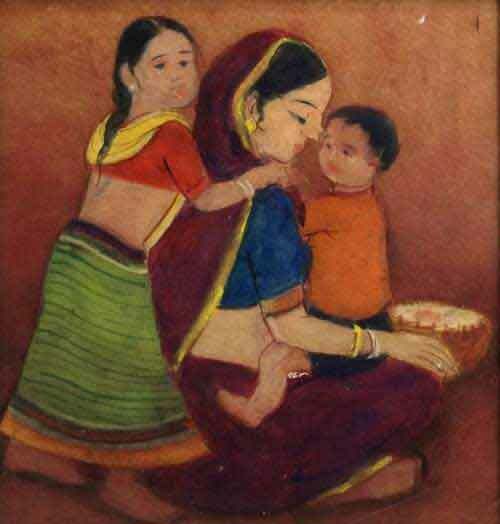 She wraps a red thread around the bowl and smears the edges with kumkum and chandan. She then listens to the Ahoi mata vrat katha in the evening. Sweets and regional delicacies are prepared and offered to the Goddess. This is later shared with children.